I’ve already talked about Tikka Masala, but Butter Masala is an entirely different beast. Yes, they may look alike, and even taste similar, but somehow they each have their own completely separate character. Also known as Murgh Makhani, Butter Masala – which is most often made with chicken – was actually an accidental invention of leftovers and thrifty cooks. 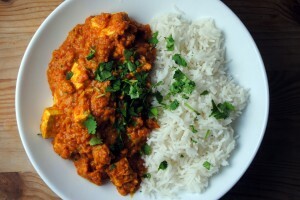 According to Cilantro Online, the dish came about at a restaurant famous for its chicken tikka. The cooks, not wanting to waste anything, would make a sauce from the juices released from the cooked chicken and the marinade, which they mixed with tomatoes and butter. Butter masala gained popularity when India’s Prime Minsiter, Jawaharal Nehru, developed a taste for it and made sure it was served at all banquets. Visiting international dignitaries began to frequent the restaurant and order the dish, and it gained a place in the international culinary cannon. The dish is simple to make and decadent to eat. You’ll want a lot of bread and rice to soak up all the gravy – naan is the obvious choice, but any toasted, flat bread will work. The majority of the flavor comes from the base of the sauce, so take your time browning the onions and spices to coax out as much flavor as possible. I used a generous amount of red chili flakes to give the dish some heat, but feel free to leave that out as it’s not traditional anyway. 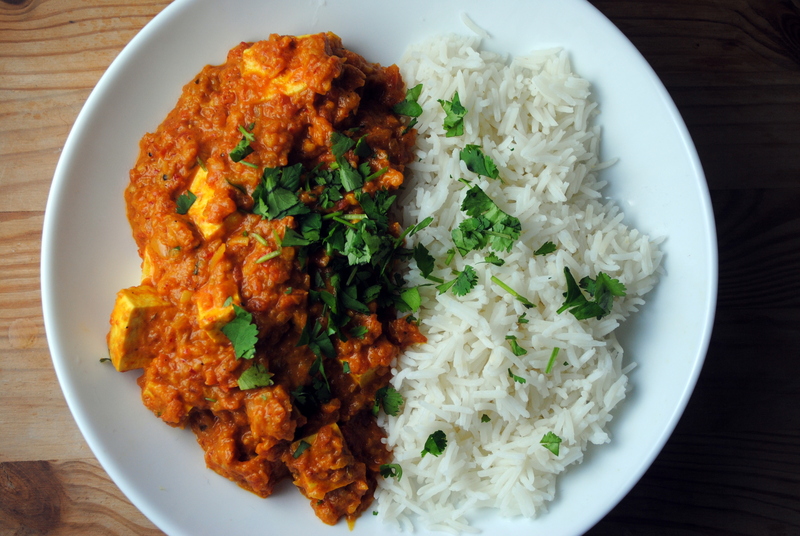 Choose whatever protein suits you – tofu, paneer (Indian cheese), chicken, or even vegetables would be good. The tofu I have been getting is really more the texture of paneer, which is what inspired me to make this in the first place. Melt the butter in a large pan over medium heat. Add the mustard seeds and cook for about 1 minute, until they pop slightly. Add the onion and garlic and stir to coat in butter. Cook until softened. Add the garam masala, cumin, coriander, turmeric, ginger, and chili powder and stir to combine. 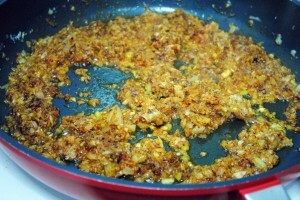 Cook, stirring often, until very aromatic and browned (but not burnt). Add the red chili flakes (if using), tomato paste and tomatoes and allow to simmer for a few minutes until slightly thickened. 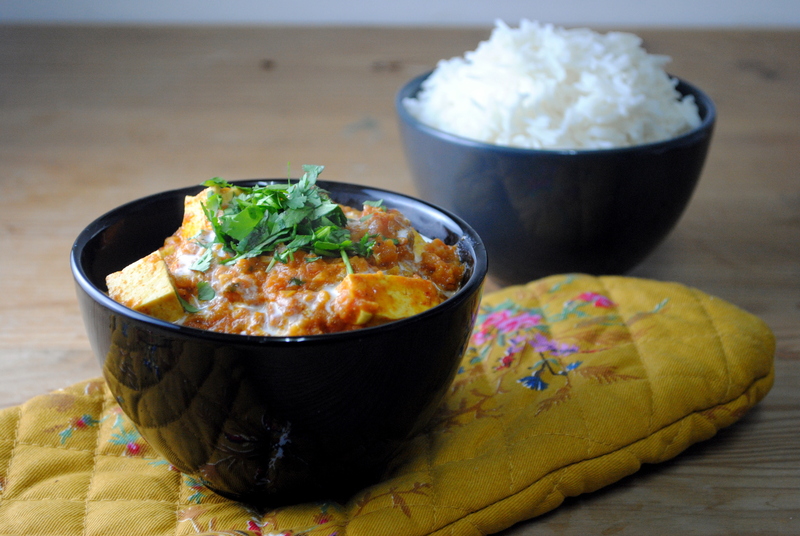 Stir in the tofu, paneer, or chicken and allow to simmer, uncovered for 15 to 20 minutes (a perfect time to cook the rice). A few minutes before serving stir in the heavy cream. Season with salt and pepper and garnish with cilantro. Serve with Basmati or Jasmine rice and naan. I can smell it cooking now. The contrast of colors on Indian plates is always so stark and stunning — “eat with your eyes” holds true! You are so right! Thanks! So did you just leave the tofu as is (kind of mushy) or drain and pre-cook it? Great question. So the tofu that I’ve been getting here in Israel has very little liquid and is insanely firm, way firmer than even extra firm tofu I’ve seen in the States and more like the texture of paneer. So for this recipe I would get the firmest tofu you can, drain it, and maybe press it between paper towels or something absorbent with a heavy object on top to help it get even firmer. Then you can just throw it into the sauce. Cooking or baking it beforehand would work as well and may be the best option when using standard tofu. Thanks for the question! Can you suggest a recipe for breakfast for Indian kitchen,which is healthy as well as fast to prepare? I am so sorry for my delayed response!! Great question. Oatmeal is always a great choice and can be quick (if instant oatmeal) or prepared in advance. Yogurt with fruit is quick and healthy too, or try making your own granola to eat with it! I enjoy fruit smoothies often made with milk or yogurt and fresh fruit. If you eat eggs, then they can provide a fast and nutritious breakfast with lots of protein. Hope this helps!